Ghausul Waqt, Mufti-e-Azam-e-Hind (Alaihir Rahmah) was born on Monday, 22nd of Zil Hijjah 1310 AH (18 July 1892) in Bareilly Shareef, India. It was in this very city that his illustrious father, the Mujaddid (Reviver) of Islam, Imam-e-Ahle Sunnat, A'la Hazrat, Ash Shah Imam Ahmed Raza Khan Qadri (Alaihir Rahmah) was born (1856 - 1921). At the time of the birth of Ghausul Waqt, Mufti-e-Azam-e-Hind, his distinguished father, was in Marehrah Shareef, one of the great spiritual centres of the Sunni World. On that very night, Sayyiduna A'la Hazrat (Alaihir Rahmah) dreamt that he had been blessed with a son and in his dream he named his son "Aale Rahmaan". Hazrat Makhdoom Shah Abul Hussain Ahmadi Noori (Alaihir Rahmah), one of the great personalities of Mahrerah Shareef, named the child "Abul Barkaat Muhiy'yuddeen Jilani". Mufti-e-Azam-e-Hind was later named "Mustapha Raza Khan". His Aqiqa was done on the name of "Muhammad", which was the tradition of the family. Upon the birth of Ghausul Waqt, Mufti-e-Azam-e-Hind (Alaihir Rahmah) Hadrat Shah Abul Hussain Ahmadi Noori (Alaihir Rahmah) told A'la Hazrat, "Mawlana! When I come to Bareilly Shareef, then I will definitely see this child. He is a very blessed child." As promised, when Hadrat Abul Hussain Ahmadi Noori (Alaihir Rahmah) went to Bareilly Shareef, he immediately summoned to see Mufti-e-Azam-e-Hind (Alaihir Rahmah) who was only six (6) months old. Sayyiduna Noori Mia (Alaihir Rahmah), as he was also famously known, congratulated A'la Hazrat (Alaihir Rahmah) and said, "This child will be of great assistance to the Deen and through him the servants of Almighty Allah will gain great benefit. This child is a Wali. From his blessed sight thousands of stray Muslims will become firm on the Deen. He is a sea of blessings." On saying this, Hadrat Noori Mia placed his blessed finger into the mouth of Mufti-e-Azam-e-Hind and made him a Mureed. He also blessed him with I'jaazat and Khilafat at the same time. (Mufti Azam Hind Number, pg. 341). Not only did he receive Khilafat in the Qaderi Silsila (Order), but also in the Chishti, Naqshabandi, Suharwardi, and Madaari Orders. Mufti-e-Azam-e-Hind (Alaihir Rahmah) also received Khilafat from his blessed father, A'la Hazrat, Ash Shah Imam Ahmed Raza Khan Al Qaderi (Alaihir Rahmah). Mufti-e-Azam-e-Hind attained most of his early education from his illustrious family - from his father, Imam Ahmed Raza Khan Qadri (Alaihir Rahmah), the Mujaddid of Islam, whose status and position even at that time cannot be explained in these few lines. He also studied Kitaabs under the guidance of Hazrat Mawlana Haamid Raza Khan (his elder brother), Mawlana Shah Rahm Ilahi Maglori and Mawlana Sayed Basheer Ahmad Aligarhi and Mawlana Zahurul Hussain Rampuri (Alaihimur Rahmah). He studied various branches of knowledge under the guidance of his most learned and blessed father, A'la Hazrat (Alaihir Rahmah). He gained proficiency in the many branches of Islamic knowledge from among which are: Tafseer; Hadith; Fiqh; Laws of Jurisprudence; Sarf; Nahw; Tajweed; Conduct of Language; Philosophy; Logistics; Mathematics; History etc. ; Arithmetic; Aqaid; Tasawwuf; Poetry; Debating; Sciences; etc. Mawlana Mustapha Raza Khan's brilliance as an Islamic Scholar manifested itself when he was a still a youth, but overflowing with knowledge and wisdom. He wrote his first historical Fatawa (Islamic Ruling) when he was only 13 years old. It dealt with the topic of "Raza'at" - affinity between persons breast fed by the same woman. The following has been recorded with regards to this ocassion. Hazrat Mawlana Zafrud'deen and Hazrat Mawlana Sayed Abdur Rasheed (Alaihimur Rahmah) were at the Darul Ifta (Fatawa Department) at this stage. One day, Mufti-e-Azam-e-Hind walked into the Darul Ifta and noticed that Hazrat Mawlana Zafrud'deen was writing a certain Fatawa. He was taking "Fatawa Razvia" from the shelf as his reference. On seeing this, Mufti-e-Azam-e-Hind (Alaihir Rahmah) said, "Are you relying on Fatawa Razvia to write an answer?" Mawlana Zafrud'deen replied, "Alright then, why don't you write the answer without looking." Mufti-e-Azam-e-Hind then wrote a powerful answer without any problem. This was the Fatawa concerning "Raza'at" - the very first Fatawa which he had written. The answer was then sent to his father, Sayyiduna A'la Hazrat for correction and verification. On seeing the authenticity of the Fatawa, Sayyiduna A'la Hazrat (Alaihir Rahmah) became delighted and immediately certified the Fatawa. Sayyiduna A'la Hazrat then signed the Fatawa. He also commanded Hafiz Yaqeenudeen to make a stamp for Mufti-e-Azam-e-Hind as a gift and said that it should read as follows: "Abul Barkaat Muhiy'yuddeen Jilani Aale Rahmaan urf Mustapha Raza Khan." This incident took place in 1328 AH. After this incident Mufti-e-Azam-e-Hind, Mawlana Mustapha Raza Khan (Alaihir Rahmah) spent another 12 years writing Fatawas at the feet of Imam Ahmed Raza (Alaihir Rahmah). He was given this immense responsibility of issuing Fatawas even while A'la Hazrat was in this physical world. He continued this trend until his last breath. The stamp which was given to him was mislaid during his second Hajj when his bags were lost. Mufti-e-Azam-e-Hind married the blessed daughter of his paternal uncle, Hazrat Muhammad Raza Khan. He had 6 daughters and one son, Hazrat Anwaar Raza (Alaihir Rahmah), who passed away during childhood. Hadrat Mufti-e-Azam-e-Hind (Alaihir Rahmah) went twice for Hajj - in 1905 and 1945. He performed his third Hajj in 1971. Mawlana Mustapha Raza Khan (Alaihir Rahmah) was the first person to go for Hajj without a photograph in his passport. He refused to take a photograph. Mufti-e-Azam-e-Hind was allowed to go for Hajj without a photograph in his passport and without taking any vaccinations. During his trip to Makkatul Mukarramah, Mufti-e-Azam-e-Hind, also had the opportunity of meeting those Ulema whom his father, A'la Hazrat (Alaihir Rahmah), met during his visit to Haramain Sharifain. These great Ulema were from amongst the students of Sayed Yahya Almaan. A few of the Ulema that he met were Allama Sayed Ameen Qutbi; Allama Sayed Abbas Alawi and Allama Sayed Noor Muhammad (Alaihir Rahmahm) - to mention just a few. 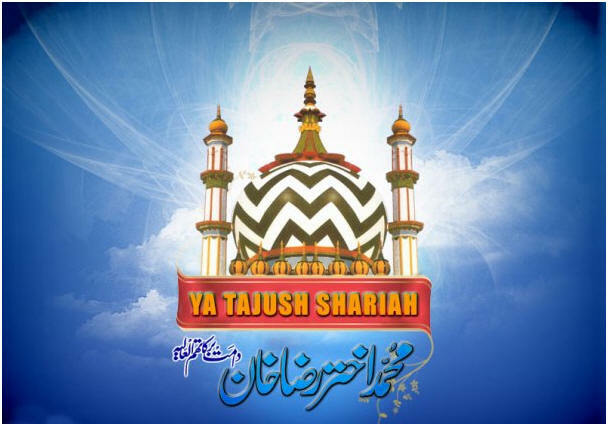 They narrated many incidents which had taken place during Imam Ahmed Raza's visit to Haramain Sharifain. They then requested Khilafat from Mufti-e-Azam-e-Hind which he bestowed upon them. Mawlana Mustapha Raza Khan (Alaihir Rahmah) was aware of the actual time of his Wisaal. On the 6th of Muharram (1981) he said, "All those who intended to become my Mureed but for some reason or the other could not come to me, I have made all of them Mureed and I have given their hands into the hand of Sayidduna Ghausul Azam (Alaihir Rahmah)." On the 12th of Muharram (1981) Hazrat said, "All those who asked me to make Dua for them, I have made Dua for their Jaiz (permissable) intentions to be fulfilled. May Allah accept this Dua." On this day he asked those that were present concerning date. They told him that it was the 12th of Muharram. On hearing this he became silent. On the 13th of Muharram, he again asked concerning the date and the Mureedeen present said that it was Wednesday, the 13th of Muharram. On hearing this Mufti-e-Azam-e-Hind (Alaihir Rahmah) said, "Namaaz will be held at Nau Mahla Musjid". Those present did not understand what he meant, but remained silent out of respect. After some time again Mufti-e-Azam-e-Hind (Alaihir Rahmah) said, "Did anybody tell you about the Namaaz. I will read Jumuah Namaaz in Nau Mahla Masjid." After some time Hazrat said, "Did anybody say anything about the Fatiha." Those present just gazed at each others faces and remained silent. Only later did they realise what Mufti-e-Azam-e-Hind was implying. Hazrat was spiritally present for Jumuah at the Nau Mahla Masjid! Mufti-e-Azam-e-Hind (Alaihir Rahmah) was not only giving hope to the Mureedeen but also informing them of his Wisaal. The shining star of A'la Hazrat, Ash Shah Imam Ahmed Raza Khan (Alaihir Rahmah), the glitter and the hope for the hearts of millions throughout the world, the Mujaddid of the 15th Century, the Imam of his time, Huzoor Sayyidi Sarkaar Mufti-e- Azam-e-Hind (Alaihir Rahmah) left the Aalame Duniya to Journey towards the Aalame Aakhira. It was 1.40 p.m. on the eve of the 14th of Muharram 1402 AH (1981). On Friday, the 15th of Muharram, at 8. 00 a.m. the Ghusl of Mufti-e-Azam-e-Hind (Alaihir Rahmah) took place. His nephew, Hazrat Mawlana Rehan Raza Khan (Alaihir Rahmah) performed the Wudhu. Taajush Shariah Hazrat Allama Mufti Mohammed Akhtar Raza Khan Azhari performed the Ghusl. Sultan Ashraf Sahib used the jug to pour water. The following persons were present during the Ghusl : Hazrat Mawlana Rehan Raza Khan, Hazrat Allama Mufti Mohammed Akhtar Raza Khan, Sayed Mustaaq Ali, Mawlana Sayed Muhammad Husain, Sayed Chaif Sahib, Mawlana Naeemullah Khan Sahib Qibla, Mawlana Abdul Hamid Palmer Razvi, Muhammad Esa of Mauritius, Ali Husain Sahib, Hajji Abdul Ghaffar, Qari Amaanat Rasool Sahib and a few other Mureeds and family members. Taajush Shari'ah and Hazrat Mawlana Rehan Raza Khan have stated that at the time of the Ghusul Shareef of Mufti-e-Azam-e-Hind (Alaihir Rahmah) the Chaadar mistakenly moved a little. Immediately, Mufti-e-Azam-e-Hind (Alaihir Rahmah) held the Chaadar between his two fingers and covered the area that the Chaadar exposed. Those present thought that the Chaadar had just got caught between Mufti-e-Azam-e-Hind (Alaihir Rahmah's) fingers. They tried to remove the Chaadar from between his fingers but it would not move. The first person to notice this Karaamat was Taajush Shari'ah Allama Mohammed Akhtar Raza Khan Azhari. He showed this to everyone. Mufti-e-Azam-e-Hind's (Alaihir Rahmah) fingers did not move until the area was properly covered. Two and a half million (2,500,000) Muslims attended his Janazah Salaah. Mufti-e-Azam-e-Hind (Alaihir Rahmah) is buried on the left-hand-side of Sayyiduna A'la Hazrat (Alaihir Rahmah). Those who lowered Mufti-e-Azam-e-Hind (Alaihir Rahmah) in his Qabr Shareef have stated that they were continously wiping out perspiration from the forehead of Mufti-e-Azam-e-Hind (Alaihir Rahmah) right up to the last minute. Wealth, presidency, ministership, worldly satisfaction and happiness can be given to a person by anyone, but such people do not have the spiritual insight to give tranquillity to a disturbed heart and they cannot put a smile onto the face of a depressed person. But Mawlana Mustapha Raza Khan (Alaihir Rahmah) gave both the treasures of the physical world and the spiritual worlds to those in need. To be his servant was not less than kingship. Every day hundreds and thousands of people in need of spiritual, physical and academic needs would come to him and each one of them returned with complete satisfaction. Mawlana Mustapha Raza Khan (Alaihir Rahmah) is that light of such an illustrious family whose radiance reflected itself in his character and manners that he displayed - such qualities that very few would be able to reach perfection. His character was the true embodiment of the Sunnah of Sayyiduna Rasulullah (sallal laahu alaihi wasallam). He shone like a star in the darkness of the night. Mufti-e-Azam-e-Hind (Alaihir Rahmah) possessed great heights of good character, moral standards, kindness, sincerity, love and humbleness. He never refused the invitation of any poor Muslim. He always stayed away from those who were very wealthy and lavish. He was the possessor of great moral and ethical values. It is stated that once Akbar Ali Khan, a Governor of U.P., came to visit Mufti-e-Azam-e-Hind (Alaihir Rahmah). Mufti-e-Azam-e-Hind did not meet him but left to a place called Puraana Shahar (Old City) to visit a poor Sunni Muslim who was very ill and at the doorstep of death. In another ocassion, Fakhruddeen Ali Ahmad, the President of a Political Party, came to visit Mufti-e-Azam-e-Hind (Alaihir Rahmah) but was refused this opportunity. Many other proud ministers had also come to meet Mufti-e-Azam-e-Hind but met with the same fate. This was due to his extreme dislike for politics and involvement in worldly affairs. Mufti-e-Azam-e-Hind (Alaihir Rahmah) never fell short in entertaining those who came to visit him. When he was physically fit he used go into the Visitors Section and ask each person whether they had eaten or not. He used to ask them if they partook in tea or not. He used to continuously enquire as to whether they were experiencing any difficulties or not. It was often seen that he would personally carry the dishes into the house for the visitors! He was definitely blessed with the characters of the "Salfe Saliheen" or The Pious Servants of Allah. Mawlana Mustapha Raza Khan (Alaihir Rahmah) was a pillar of hospitality and humbleness. If he reprimanded a certain person for doing something un-Islamic or if he became displeased with anyone for some reason or the other, he used to also explain to the person in a very nice way and also try to cheer that person. He would then make Dua in abundance for such a person. His Mureeds (Disciples), on many ocassions, used to recite Manqabats (Poetry) in his praise. On hearing such Manqabats he would say, "I am not worthy of such praise. May Allah make me worthy." Many people came to him for his blessings. Others would come for Ta'weez. He never refused anyone. It is also not known how many homes were being supported through the kindness and hospitality of Mufti-e-Azam-e-Hind. He always entertained those who came from far and near to the best of his means. He used to even give most of his visitors train and bus fares to travel. In winter, he would give warm clothes, warm sheets and blankets to the poor and the needy. Mufti-e-Azam-e-Hind gave Khilafat to many Ulema-e-Ikraam and personally tied the Amaama (Turban) on their heads. He gave cloaks, turbans and hats to many people. Once, during winter, a few of the Khaadims were present with Mufti-e-Azam-e-Hind (Alaihir Rahmah). He was lying on his bed and covered with a shawl. A certain Mawlana Abu Sufyaan touched Mufti-e-Azam-e-Hind's shawl and commented as to how beautiful it was. Mufti-e-Azam-e-Hind (Alaihir Rahmah) immediately removed the shawl and presented it to him. Although the Mawlana refused to accept it Mufti-e-Azam-e-Hind gave it to him forcefully. Mufti-e-Azam-e-Hind (Alaihir Rahmah) always wanted to see a Muslim's inner and outer personality. He always advised them to mould their lives according to the principles and the commands of Islam. He always showed discomfort to those who did not have beards, those who wore hats and to those who wore ultra-western clothes. He used to warn such Muslims. Mawlana Mustapha Raza Khan (Alaihir Rahmah) used to show his displeasure towards those who wore ties. He used to tug at their ties and commanded them to abstain from wearing a tie. He also asked them to make Tauba from such acts. Mawlana Mustapha Raza Khan (Alaihir Rahmah) always commanded Muslims to give or take anything with their right hand. He stopped the Muslims from calling the governments as their "Sarkaar" or leaders. He never kept any ordinary Kitaab on the books of Tafseer or Hadith. Whenever he sat in a Meelad-un-Nabi (sallal laahu alaihi wasallam) or Mehfil-e-Zikr, he always sat with utmost respect until the very end. Mufti-e-Azam-e-Hind never spat towards the Qibla. He never stretched his legs in the direction of the Qibla. Whenever he entered the cemetery, he never used his entire feet to walk on the ground. He always walked on his toes. At times, he would stand on his toes for about half an hour in the graveyard making Du'a-e-Maghfirat! He always stopped Muslims from doing any false fortune telling. If any death or loss took place in the house of a Muslim, Mufti-e-Azam-e-Hind (Alaihir Rahmah) would go to comfort the people of that house but he would never eat there. He always advised those in sorrow to make Sabr and remember Almighty Allah. He always respected Ulema-e-Ikraam. He respected the Sayeds in such a manner as a slave will respect his King. He prohibited Muslims from keeping un-Islamic names. He preferred such names as Abdullah, Abdur Rahmaan, Muhammad and Ahmad. Mufti-e-Azam-e-Hind always performed his Salaah in Jamaah whether he was on journey or not. The moment he put his foot out of his house to go towards the Masjid, he used to be surrounded by his Mureeds (disciples) and well-wishers who would follow him till the Masjid door which was just a few feet away from his house. While some would be kissing his blessed hands, others tried to talk with him. He would reply to all those who made Salaam to him. On entering the Masjid, he would immediately recite the dua prescribed. Mawlana Mustapha Raza Khan (Alaihir Rahmah) would then remove his Amaama and then sit down to perform Wudhu. He would wash all the parts thoroughly so that the Sunnahs were accomplished. He would perform his Salaah with great sincerity and used to be lost in the worship of his Creator. The person who looked at him from a distance would have instantly understood that Mufti-e-Azam-e-Hind (Alaihir Rahmah) had left all the worldly desires and was intent upon pleasing his Creator. Once, while Mufti-e-Azam-e-Hind (Alaihir Rahmah) was travelling from Nagpur, it was time for Maghrib Salaah. He immediately disembarked from the train. The people told Mufti-e-Azam-e-Hind that the train was about to leave, but he was intent on performing his Salaah. His companions also disembarked with him. They had just performed their Wudhu and were making Niyyah for Salaah when the train left the station. All of Mufti-e-Azam-e-Hind's and his companions luggages' were left on the train. A few un-Islamic people who were there said "the Mias train had left him". Mufti-e-Azam-e-Hind was still in Salaah. When they all had completed their Salaah, they noticed that the station platform was empty. They became a little worried since all their luggage had gone with the train, but still Mufti-e-Azam-e-Hind (Alaihir Rahmah) looked undisturbed. His companions were busy talking about the luggage when they noticed the station guard, followed by a group of travellers, running towards them. The guard came up to Mufti-e-Azam-e-Hind and said, "Huzoor! The train is stuck!" Mufti-e-Azam-e-Hind (Alaihir Rahmah) said, "The engine is damaged." The train was brought back and Mufti-e-Azam-e-Hind (Alaihir Rahmah) and his companions sat in the train. After some repairs the train left with him and his companions seated in it! Mufti-e-Azam-e-Hind, Mawlana Mustapha Raza Khan (Alaihir Rahmah) was drowned in the love for the Holy Prophet, Sayyiduna Rasulullah (sallal laahu alaihi wasallam). Everything he did was for the pleasure of Almighty Allah and Sayyiduna Rasulullah (sallal laahu alaihi wasallam). All that he had gained was due to the intense love which he possessed for the Holy Prophet (sallal laahu alaihi wasallam). His extreme and intense love for the Holy Prophet (sallal laahu alaihi wasallam) can be understood by the fact that during the latter stages of his life, even though he was very ill, he would sit for hours with great respect in the Naat Mehfils and would shed tears in his love for Sayyiduna Rasulullah (sallal laahu alaihi wasallam). He used to celebrate the Meelad-un-Nabi (sallal laahu alaihi wasallam) each year with great splendour. The programme used to begin on the eve of the 12th of Rabi-ul-Awwal and used to continue till the next day just before lunch. The invitation was open to all Muslims and they all used to be fed. Even after examining the Naat Shareefs written by Mufti-e-Azam-e-Hind (Alaihir Rahmah) one would see that every word written displayed his measureless love for the Holy Prophet (sallal laahu alaihi wasallam). In the world of poetry, Mufti-e-Azam-e-Hind, Mawlana Mustapha Raza Khan was a Giant of his time. Most of his poems were in the form of Hamd (Praise of Allah), Naat Shareef, Qasidas and Manqabats compiled in the Arabic, Urdu, Persian and Hindi languages. All these poems were compiled into a book which is famously known as "Samaane Bakhshish" which is still available toady. Samaane Bakhshsish is a treasure chest which flows with pearls of love for Sayyiduna Rasoolullah (sallal laahu alaihi wasallam). The compilation of Samaane Bakhshish is through the blessings of Sayyiduna Rasoolullah (sallal laahu alaihi wasallam). When Mufti-e-Azam-e-Hind (Alaihir Rahmah) returned from his journeys he would become engrossed in the writing of Fatawas, yet he found the time to prepare Samaane Bakhshsish and many other kitaabs. In the world of poetry, Mufti-e-Azam-e-Hind (Alaihir Rahmah) was known as "Noori". "Once a very young descendant of Sayyiduna Sheikh Abdul Qaadir Jilani (Alaihir Rahmah), Hazrat Peer Taahir Ala'uddeen (Alaihir Rahmah), visited Bareilly Shareef. The respect and honour that Mufti-e-Azam-e-Hind showed towards him was out of this world. Mufti-e-Azam-e-Hind used to walk bare feet behind him with great respect." The great Ulema of the time have stated that Mufti-e-Azam-e-Hind (Alaihir Rahmah) was lost to such an extent in the love for Sayyiduna Ghausul Azam, Sheikh Abdul Qaadir Jilani that even physically he began to resemble Sheikh Abdul Qaadir Jilani (Alaihir Rahmah). Ghausul Waqt, Mufti-e-Azam-e-Hind (Alaihir Rahmah) had great respect and love for the Ulema and for Sayeds (Descendants of Sayyiduna Rasulullah - sallal laahu alaihi wasallam). The respect which he showed towards them is beyond explanation. One day, in 1979, a lady came with her little child to ask for Ta'weez. It was a very hot day and she was informed that Mufti-e-Azam-e-Hind (Alaihir Rahmah) was resting. The lady, however, was in great need for the particular Ta'weez. She asked someone to see if Mufti-e-Azam-e-Hind was awake but nobody had the nerve of going near him while he was resting as they considered this to be disrespectful. Taking her child she commented, "What did we know that the words of Sayeds will not be heard in this place". It is not known how Mufti-e-Azam-e-Hind (Alaihir Rahmah) heard this, but he immediately summoned one of the Mureeds. He instructed him to call the lady and not give her grief. The woman then sent her child to Mufti-e-Azam-e-Hind (Alaihir Rahmah). He asked the child's name and showed great love and respect towards this young child. With great affection, he placed his hand on the child's head. He even asked someone to bring an apple for the child. From behind the curtain, he spoke to the lady concerning her problem and immediately wrote a Ta'weez for her. Mufti-e-Azam-e-Hind then sent a message to his family requesting that the mother and child should only be allowed to leave after the heat became less intense; that they should be well entertained and that no shortage should be spared in entertaining these Sayeds. When Allama Sadrush Shariah Mawlana Amjad Ali Qadri (Alaihir Rahmah), the author of the famous "Bahare Shariah," used to come to Bareilly Shareef for the Urs Shareef of Sayyiduna A'la Hazrat (Alaihir Rahmah), Mufti-e-Azam-e-Hind used to go to the railway station to welcome him and showed great respect towards this Scholar of Islam. He also showed great respect towards Hafiz-e-Millat and Hazrat Mawlana Hasmat Ali Khan Sahib (Alaihir Rahmah). He also showed respect towards his own Mureeds and Khalifas who were Aalims. Mawlana Mustapha Raza Khan (Alaihir Rahmah) was one such person. He is one of the greatest leaders of the Sunnis. His boldness and fearlessness is difficult to explain. His entire life was spent speaking against Deobandis, Wahabis and all the other misleading sects, whether is was against the West, Qadianism, or Najdism he always challenged them right till the very end. He always propagated the true Deen and the Path of the Ahle Sunnah Wa Jamaah. With his Fatawa, he helped protect the Imaan of not only the Muslims in India and Pakistan, but of Muslims throughout the world. He attacked the enemies of Islam through his writings, sayings, actions, etc. He did everything in his capacity to challenge the enemies of Islam. No person in his presence could say or do anything against Shari'ah. No person could speak against that which was the truth. It is stated by one of Mufti-e-Azam-e-Hind's Khaadim's, who accompanied him on a journey by train, that there were some people in the train who were consuming alcohol. When Mufti-e-Azam-e-Hind (Alaihir Rahmah) saw them, he reprimanded them and told them to desist from such a Haraam act. They did not listen to his advise so he scolded the leader of the group who was a young and well-built person. He gave the young person a hard slap which caused the bottle of alcohol to fall far from his hand. The Khaadim expected the person to retaliate but, who had the nerve to retaliate against this Lion of Islam! They became afriad and sat down quietly. Later some of them came up to Mufti-e-Azam-e-Hind and begged for forgiveness for their shameful behaviour. Mufti-e-Azam-e-Hind, Mawlana Mustapha Raza Khan (Alaihir Rahmah), who after writing his first Fatawa while still a student at "Darul Uloom Manzare Islam", was given the status of Mufti due to his immense knowledge. When the Muslim World began to see his knowledge and Fatawas brightenening the world, they began calling him "Mufti-e-Azam" or The Most Exalted Mufti of the Time. This title alone became the name he was recognised by. Whenever the name "Mufti Azam Hind" was mentioned, it referred to none other than his exalted personality. Remember that he or she only is exalted who has been blessed with this excellence by Almighty Allah and His Beloved Rasool (sallal laahu alaihi wasallam). Mawlana Mustapha Raza Khan (Alaihir Rahmah) was a personality free from pride, lavishness and self- fame. His status was bestowed upon him by Almighty Allah and His Beloved Rasool (sallal laahu alaihi wasallam). That person to whom Almighty Allah and His Rasool (sallal laahu alaihi wasallam) grants such excellence, then such excellence cannot be understood by ordinary mortals. This is one of the reasons why the entire world was brightened and received the benefits of his knowledge of Fiqh. There came a stage when Mufti-e-Azam-e-Hind (Alaihir Rahmah) was not only known as "Mufti-e-Azam-e-Hind" but he was also known as "Mufti-e-Azam-e-Alam" or The Grand Mufti of the World. "The Command of Shariah is to sight the Moon and fast or celebrate Eid. Where the Moon is not sighted the Qazi should give an Islamic decision in connection with a confirmation. The moon must be sighted from the ground level or any place attached to the ground. With regards to the matter of using the plane - to sight the moon via a plane is wrong because the moon sets and does not perish. This is why it is sometimes sighted on the 29th and sometimes on the 30th. If to fly in a plane to sight the moon is a condition, then by increasing altitude the moon will be sighted even on the 27th and 28th. In this case, will the sighting be confirmed for the 27th or 28th? No person in his right sense will accept this. Thus under these circumstances, how would it be proper to sight the moon on the 29th?" This Fatawa of Mufti-e-Azam-e-Hind, Mawlana Mustapha Raza Khan (Alaihir Rahmah) appeared in every newspaper in Pakistan as "Headline News". The following month, on the 27th and the 28th, the Pakistan Government sent an aeroplane at a higher altitude and found that the moon was visible on these days. The Government of Pakistan then accepted the Fatawa of Mufti-e-Azam-e-Hind and the Hilaal Committee of Pakistan was disbanded. Mufti-e-Azam-e-Hind (Alaihir Rahmah) wrote more or less 50 000 Fatawas in his lifetime. His word was accepted by great Ulema. Shamsul Ulema, Hazrat Mawlana Shamsud'deen Ja'fari (Alaihir Rahmah) stated: "In this era, there is no greater expert in Fiqha than Huzoor Mufti-e-Azam-e-Hind. Whenever I present myself in his high court I always sit with my head bowed and I listen to his words in silence. I do not have the audacity to talk in abundance to him." The year 1976 was a very difficult period for the Muslims in India. Certain Ulema, bought of by the Saudi Riyals and American Dollars, passed the Fatawa making Vasectomy (male sterilisation to prevent birth of children) permissible. The Indian Government made Vasectomy necessary for every male in India at that time. Muslims of India were in search of a Saviour to prevent such a law from being passed as this would mean them not having any more children. They were looking for someone who would stand and fight for their religious rights. All the Muslims looked towards the city of Bareilly Shareef, the city of light and truth, for an answer to this controversy. All of a sudden that Mujahhid of Islam rose with the torch of knowledge and light against the winds of enmity and destruction - Mufti-e-Azam-e-Hind (Alaihir Rahmah). He immediately issued the true Fatawa on vasectomy and said, "Vasectomy is Haraam, Haraam, Haraam." This news spread throughout India. Through the Dua and firmness of Mufti-e-Azam-e-Hind on this issue, the Government that wished to pass this law had lost power, and a new government came into power. The law on Vasectomy was abolished! Once, Mawlana Abdul Hadi Al Qaderi and Soofi Iqbal Sahib asked Ghausul Waqt, Mufti-e-Azam-e-Hind the following question: "Huzoor! Can one remember his Sheikh in Namaaz?" Mufti-e-Azam-e-Hind (Alaihir Rahmah) answered by saying, "If you need to remember anyone in Namaaz then you should remember Taajedare Do Aalam, Habbibe Khuda (sallal laahu alaihi wasallam). Yes, just as people tend to gaze here and there in Namaaz - if, in this way, the thought of one's Peer comes into the mind, then there is no hinderance". Subhan-Allah! Such caution is in this answer! This answer has also contradicted the Deobandi belief. By looking at the life of Mufti-e-Azam-e-Hind and reading his Fatawas, one would see his status and excellence in the spiritual domain. His spiritual life was according to that of his renowned and distinguished father (Alaihir Rahmah). When the Americans were announcing there journey to the moon, a few Ulema were present with Mawlana Mustapha Raza Khan (Alaihir Rahmah). Amongst these Ulema were Shamsul Ulema Hazrat Mawlana Shamsud'deen and Allama Ghulam Jilani Mirati (Alaihir Rahmah). They were discussing the concepts concerning the sun and the moon. Mufti-e-Azam-e- Hind said that the sky and the earth are both stationary and that the moon and the sun are in motion. On hearing this Allama Ghulam Jilani Mirati (Alaihir Rahmah) said, "In the Holy Quran it is said, 'Wash Shamsu Tajri Li Mustaqaril'laha'. In other words, the sun is in motion in its fixed abode. From the word 'Tajri', it is obvious that the sun is in motion and from the word 'Mustaqaril'laha' it is obvious that it is stationary in one place. How can both these concepts be right?" In answer to this, Mawlana Mustapha Raza Khan (Alaihir Rahmah) immediately said, "It was commanded to Hazrat Adam (alaihis salaam) and Hazrat Hawa (radi Allahu anha) (as follows): 'Walakum fil Ardi Mustaqar'. Does this mean that they were stationary in only one portion of the earth? Did they not walk around (on the earth)? To be Mustaqar means to be stationary in your surrounding, not to come out of your boundaries. To move but to move within your boundaries of movement." On hearing this Allama Mirati Sahib (Alaihir Rahmah) became silent. "IN THIS TIME, THAT PERSONALITY WHOSE TAQWA (PIETY) IS MORE THAN HIS FATAWA, IS NONE OTHER THAN THE SON OF SAYYIDI A'LA HAZRAT (Alaihir Rahmah) WHOSE BEAUTIFUL NAME IS MUSTAPHA RAZA AND THIS NAME COMES ON MY TONGUE WITHOUT PROBLEM AND IT ALLOWS ME TO GAIN GREAT BLESSINGS." Once Hazrat Muhaddith-e-Azam (Alaihir Rahmah) wrote the following words on the Fatawa of Mufti-e-Azam-e-Hind (Alaihir Rahmah): "THIS IS THE SAYING OF SUCH AN AALIM WHOM TO FOLLOW IS COMPULSORY "
"A PERSON DOES NOT GET PROPER RESPECT AND ACCEPTANCE IN HIS OWN TOWN, BUT THE ACCEPTANCE AND RESPECT THAT HUZOOR MUFTI AZAM HAS GAINED IN HIS TOWN CANNOT BE FOUND ANYWHERE ELSE. THIS IS OPEN PROOF OF HIS KARAMAAT AND WILAYAT". He then said, "MUFTI AZAM IS A KING, HE IS A KING". (Which means that he should be respected and treated as a King). "IN THIS TIME, THE PERSONALITY OF HUZOOR MUFTI AZM HIND (Alaihir Rahmah) IS A UNIQUE ONE, ESPECIALLY IN THE FIELD OF IFTA, BUT ALSO IN HIS DAILY CONVERSATIONS - THE MANNER IN WHICH HE SPOKE AND EXPLAINED CAN BE UNDERSTOOD BY ONLY THE PEOPLE OF KNOWLEDGE." "THE STATUS OF SAYYIDI MUFTI AZAM HIND (Alaihir Rahmah) CAN BE UNDERSTOOD FROM THIS THAT HE IS THE SON AND THE BELOVED OF MUJJADIDE DEEN-O-MILLAT, IMAM AHLE SUNNAT, ASH SHAH IMAM AHMAD RAZA KHAN (Alaihir Rahmah)." "AFTER THE WISAAL OF MY MURSHAD, THE CENTRAL POINT OF MY FOCUS WAS THE PERSONALITY OF HUZOOR MUFTI AZAM HIND (Alaihir Rahmah) AND NOT ONLY WAS HE THE POINT OF MY FOCUS, BUT ALSO THAT OF THE ENTIRE SUNNI POPULATION." These outstanding qualities can be found in the life of Mufti-e-Azam-e-Hind. He was always steadfast and firm on Shariat-e-Mustapha (sallal laahu alaihi wasallam). It is said that it is impossible to move a mountain from its place but it was not possible to move Mufti-e-Azam-e-Hind from the Shariat-e-Mustapha (sallal laahu alaihi wasallam). Every second in the life of Mufti-e-Azam-e-Hind was a Karaamat. Volumes can be written about the Karaamats of Mufti-e-Azam-e-Hind (Alaihir Rahmah). He himself is a living Karaamat! Once Hazrat went for the Urs of Hazrat Mehboob-e-Ilahi, Khwaja Nizaamud'deen Awliyah (Alaihir Rahmah) to Delhi. He stayed at a place called 'Koocha Jilan' with Ashfaaq Ahmad Sahib. At this place, a certain Wahabi Maulvi began arguing with Hazrat concerning the Ilme Ghaib (Knowledge of the Unseen) of Huzoor Anwar (sallal laahu alaihi wasallam). Ashfaaq Ahmad Sahib asked Hazrat not to argue with this person as it would not make any difference to him. Hazrat said, "Let him speak. I will listen to him and all those who are present should also listen attentively. The reason why nothing makes a difference to Maulvi Sahib is because nobody listens to him properly. So let him say that which he wishes." Maulvi Saeedud'deen then spoke for approximately 15 minutes explaining how Rasoolullah (sallal laahu alaihi wasallam) did not possess Ilme Ghaib. He spoke for some time and then became silent. This question was not yet completed when the Wahabi Maulvi fell at the feet of Mufti-e-Azam-e-Hind and said, "Hazrat! It is enough. The problem has been solved. Today I have realised that Huzoor (sallal laahu alaihi wasallam) has Ilme Ghaib. If not by now the Munaafiqeen would have destroyed the Islamic Missions. If Almighty Allah has shown you those things about me which nobody else here knows about, then I cannot imagine all that which He has informed Rasoolullah (sallal laahu alaihi wasallam) of." The Wahabi Maulvi immediately repented and became Mureed of Mufti-e-Azam-e-Hind (Alaihir Rahmah). Each year, Mufti-e-Azam-e-Hind (Alaihir Rahmah) used to go to Calcutta for missionary work. The Pope used to also visit Calcutta and although he received good coverage in the media, very few Christians turned up to meet the Pope. The Christians of Calcutta became very jealous whenever Mufti-e-Azam-e-Hind visited that city as, without any news coverage, he attracted thousands of people who came to see him. The Christians decided to insult Huzoor Mufti-e-Azam-e-Hind and lower his personality in the eyes of the people. They trained three Christians to approach Huzoor Mufti-e-Azam-e-Hind with the pretence that they were going to become his Mureeds. This was their plan: Whenever Hazrat was going to make any person his Mureed, he would ask the person to say, "Say that you have given your hand into the hands of Ghaus-e-Azam (Alaihir Rahmah)." The Christians where then going to say that Hazrat is a liar (Allah forbid) since that was not the hand of Ghaus-e-Azam! The three Christians, now disguised as Muslims went to Huzoor Mufti-e-Azam (Alaihir Rahmah) with the pretence of becoming his Mureed. When two of the Christians saw Hazrat's noorani face they became afriad of carrying out their plans, but the third Christian, who was very stubborn, decided to carry out the plan. He sat in front of Huzoor Mufti-e-Azam-e-Hind (Alaihir Rahmah) and Hazrat proceeded with making him a Mureed. When Hazrat said, "Say that you have given your hand into the hands of Ghaus-e-Azam," he said, "I am giving my hand in the hand of Mufti-e-Azam." He was implying that Hazrat was asking him to lie when he was made to say a moment ago that he is not going to lie. Huzoor Mufti-e-Azam-e-Hind (Alaihir Rahmah) again commanded him to say, "Say that you have given your hand into the hands of Ghaus-e-Azam (Alaihir Rahmah)." He again said, "I am giving my hand in the hand of Mufti-e-Azam." Huzoor Mufti-e-Azam-e-Hind came into a Jalaal (Spiritual Anger) state and said, "Say that you are giving your hands into the hands of Ghaus-e-Azam." To the surprise of many, the Christian began continously saying, "I have given my hands into the hands of Ghaus-e-Azam, I have my given hands into the hands of Ghaus-e-Azam ..."
When asked about his behaviour, the Christian said that as Huzoor Mufti-Azam-e-Hind (Alaihir Rahmah) commanded him for the final time to say that he has given his hands into the hands of Ghaus-e-Azam (Alaihir Rahmah), he actually saw two bright hands emerging from Hazrat's hands and the Christian says that he is sure that these hands were none other the mubarak hands of Ghaus-e-Azam. That Christian then asked Huzoor Mufti-e-Azam-e-Hind (Alaihir Rahmah) for forgiveness and explained to him what his true intentions were. He immediately accepted Islam and became a Mureed. The news of this Karaamat spread far and wide and thousands of Christians accepted Islam at Hazrat's hands. Subhan-Allah! This incident was narrated by Hazrat Mawlana Abdul Hamid Palmer Noori Razvi, a close Khalifa of Huzoor Mufti-e-Azam-e-Hind (Alaihir Rahmah). 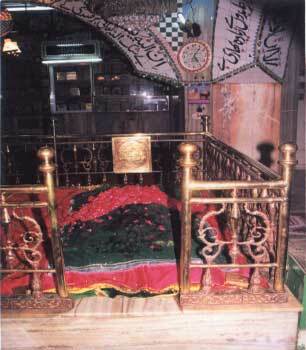 Huzoor Mufti-e-Azam-e-Hind's (Alaihir Rahmah) Mazaar Shareef is situated in Mohalla Saudagran, Bareilly Shareef. Every year thousands of Mureeds and lovers of Huzoor Mufti-e-Azam-e-Hind present themselves at Bareilly Shareef for his Urs Mubaarak. Mufti-e-Azam-e-Hind's Mureedeen were not only ordinary people but his Mureeds also consisted of great Ulema, Muftis, Mufassirs, Poets, Philosophers, Professors, Doctors, etc. It is said that he has millions of Mureedeen. In India - Mufas'sire Azam Hind Hazrat Ibrahim Raza (Alaihir Rahmah); Hazrat Mawlana Tahseen Raza Khan; Hazrat Mawlana Rehan Raza Khan (Alaihir Rahmah); Hazrat Allama Mufti Mohammed Akhtar Raza Khan Azhari; Muhadithe Kabeer Hazrat Mawlana Mufti Zia Ul Mustapha Sahib; Hazrat Mawlana Arshadul Qaadri Sahib.